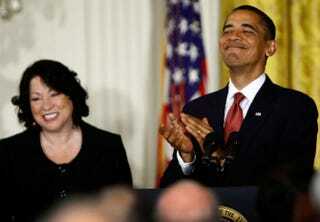 President Barack Obama (right) applauds newly appointed Supreme Court Justice Sonia Sotomayor during a reception in her honor at the White House Aug. 12, 2009, in Washington, D.C.
Supreme Court Justice Antonin Scalia—a relentless conservative if ever there was one—made his journey home Saturday morning, enabling President Obama to appoint yet another judge to the highest court in our land. If the Republican-controlled Congress doesn't bottle-neck it, it will be Obama's third appointment. Democrats, liberals and black Americans on social media reacted to the news with muted enthusiasm. After all, it's not kosher, appropriate or ethical to celebrate anyone's passing. But there were a few think pieces that were quickly drummed up, or republished, praising the idea that the Supreme Being anointed Obama's presidency so that he would be given this rare opportunity to leave such a huge mark on one of the nation's most important institutions. Reactions on social media expressing those sentiments ranged from insightful to chuckle-worthy. Some people took it as an opportunity to slam Scalia's views on women's reproductive rights. There was also a lot of joy that Scalia's regressive views on black Americans and other nonwhite groups would be less of a presence on the court. A CNN video transcribing what Scalia had to say about black Americans attending selective universities is cringeworthy. I mean, didn't this issue get wrapped up in the Brown v. Board of Education decision? And then there's the debate about whether or not Obama ought to select a nominee, since it's an election year and he only has about 11 more months in office. Some Republicans think he should leave it to his successor, but Sen. Elizabeth Warren (D-Mass.) went in on that argument and its disregard for the Constitution. We have a phenomenal short list of nominees Obama ought to consider. We're looking forward to his pick.